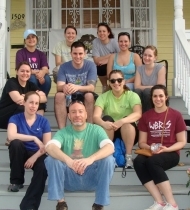 Yoga Class to benefit New Orleans | Roots and Wings yoga and healing arts, Natick, MA"
David Helfand teaches this yoga class to raise money for New Orleans. This one hour Kripalu yoga class is followed by a 20 minute guided meditation. After class join us for a brief Q&A about the CARE organization and the work they are doing in New Orleans. All proceeds will go towards the MSPP CARES organization. MSPP CARE (Communities Assisting Relief Efforts) is a student-interest group with a commitment to community service. Members will organize and implement volunteer projects that provide aid and outreach to individuals and communities in need. In addition to joining community building efforts and providing hands on relief, CARE will raise funds, supplies, and awareness for communities requiring assistance. Participants of CARE will take part in a structured, team oriented immersion experience that is culturally rich and expands members' understanding of community and self.